Motorola went ahead and befuddled everyone last month when it announced a small upgrade to its G5/G5 Plus with the newer G5S and G5S Plus, then revealed there were two versions: one for the US without NFC and one for Europe with NFC, and then clarified that only the Plus would come to the US. Now that day has come and the G5S Plus is up for pre-order in the US on several sites. The price is reduced for a limited period of time (except on Frys): the 3GB/32GB version can be had for $229.99 instead of $279.99 and the 4GB/64GB version is down from $349.99 to $299.99. As for what you're getting, the G5S Plus is an unlocked device that works on all carriers in the US. It has an all-metal unibody, a 5.5" 1080p display, a Snapdragon 625, dual 13MP rear cameras and an 8MP front shooter, a 3000mAh battery, a 3.5mm headset port, and a fingerprint sensor on the front. Decent specs overall, but keep in mind there's no NFC and the charging happens over MicroUSB. The good news is that it will get Oreo and its kernel source code has been released. 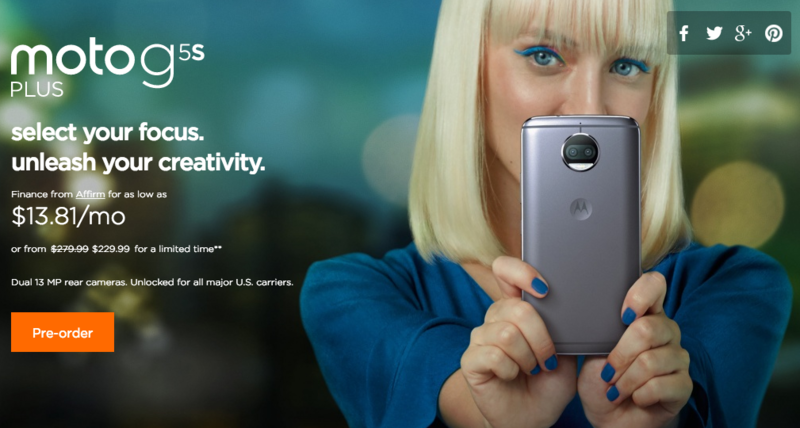 Motorola.com (discounted pre-orders): 32GB ($229.99), 64GB($299.99), no shipping date estimate. B&H (discounted pre-orders): 32GB grey ($229.99), 64GB grey ($299.99), 32GB gold ($229.99), 64GB gold ($299.99), no shipping date estimate. BestBuy (discounted pre-orders): 32GB grey ($224.99), 64GB grey ($299.99), 32GB gold ($229.99), 64GB gold ($299.99), all estimated to ship on September 26. Newegg (discounted pre-orders until October 14): 32GB grey ($229.99), 64GB grey ($299.99), 32GB gold ($229.99), 64GB gold ($299.99), all estimated to ship on September 29. Frys: 32GB grey ($279.99) and 64GB grey ($349.99) estimated to ship Sep 28, 32GB gold ($279.99) and 64GB gold ($349.99) estimated to ship Oct 5.